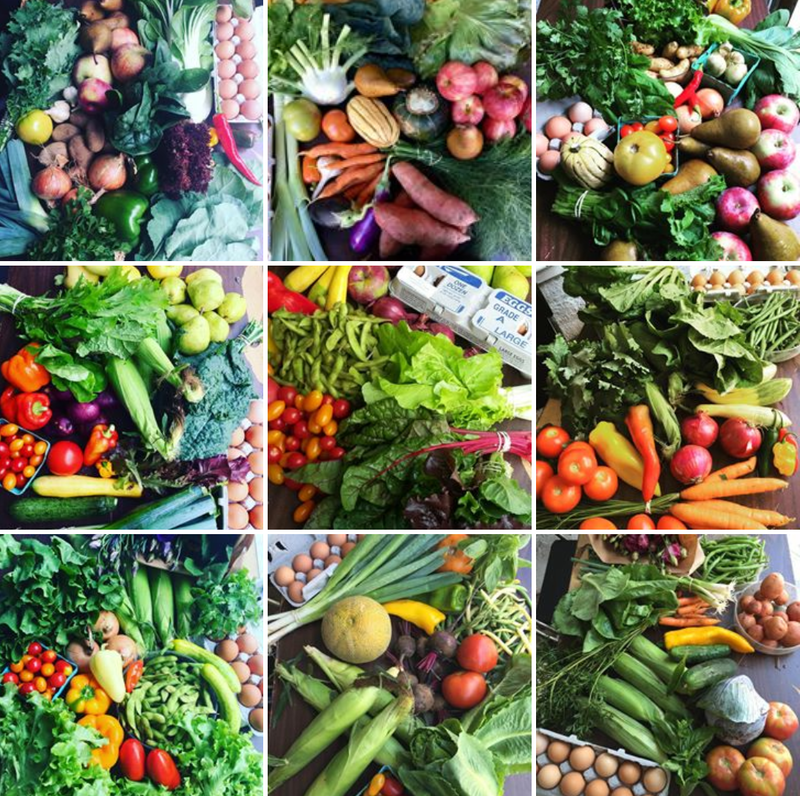 Registration is open for the 2019 season of the Prospect Park CSA. Payment plans are available, and spots in each pricing tier are limited, so sign up soon! Sign up for your CSA share here! Spring is inching closer! Your PPkCSA core group met this week to prep for the start of the 2019 season—our 9th season! Mark your calendar for your first share pick-up on Tuesday, June 4, and start daydreaming now about Farmer Ted’s sweet, midsummer tomatoes! Registration link will go live here in a couple weeks. If you were a 2018 member (or are on our wait list) you’ll get an email reminder to sign up. Did you know that the PPkCSA accepts SNAP benefits? Want to help us increase access to healthy, local, sustainably farmed produce? Print a flyer (postcard format or pull-tab flyer) to post at your neighborhood school, playground, or community board meeting! As always, thanks for being part of this thing, and we’ll see you soon! Our Week 1 share made for some amazing fried rice with bok choy, happy rich, green onions, and kale—and we gobbled Ted’s strawberries. How about you? As we enter Week 2, registration is closed. To hear it first when sign-ups open for the 2018-19 winter share or 2019 summer share, leave your info here. Also, we are heading into kohlrabi territory. Did you know this crunchy little friend is chock full of potassium, iron, calcium, B-complex vitamins, vitamins C and A, fiber, antioxidants, and more? If you’re not sure what to do with yours, Martha’s got you covered—from slaw to sauté to baked chips. PPkCSA’s 2018 season begins in JUST ONE WEEK, so dust off your veggie-hauling bags, update your calendar with our NEW distribution location, sign up for your work shifts, and get ready for your weekly produce high—we’ll see you next Tuesday, June 5 from 5:30-8:15 p.m.! Also, if you’re interested in joining our core group of organizers in exchange for a free half share, please contact info@prospectparkcsa.org. We’re in particular need of an extra hand to close the distribution site (semi-regularly) on Tuesday nights. NEW location: Starting this year, our weekly distribution will be at Crow Hill Cross Fit (1010 Dean Street, between Classon and Franklin). Dates and times: The 2018 season runs June 5 through October 30. The distribution window for your weekly share pick-up is the same: Tuesdays from 5:30-8:15 p.m.
Payments: As always, members can opt to pay for their share(s) in one lump sum or three monthly installments (May, June, July). Work shifts: By purchasing a share, members commit to working one or two shifts between June and October. Full-share members work two shifts; half-share members work one shift. Shifts are 60 to 105 minutes. Share options: PPkCSA offers a vegetable share from Windflower Farm, plus add-on fruit, flower, and egg shares. Members can also order a la carte meats, cheeses, grains, spices and more from Lewis Waite, delivered every other week. Sign up for your 2018 CSA share today! Happy Spring! We are getting ready for another amazing season of delicious produce from Windflower Farm & Co.
A couple folks have asked when sign-ups will open. The answer is: very soon! Fact is, we’re just a scosh behind because our beloved CSA site hosts, Troy and Susan at Fountain Studios, are moving to Chicago (yay them!) which means we’re working to secure a new CSA distro site (wah us). Also, thank you for your responses to our 2017 survey. We’re working to address your concerns—and of course we bask in your loving praise! We’ll be in touch about it all soon. First, though, look for a message with a link to PPkCSA 2018 season registration in the next couple of weeks! And if you have a good lead on a space, please do let us know—thanks! I’m probably just a little too pleased with that title. So you’d have to be, like, totally inept not to be able to store winter squashes relatively well in the short term. It’s like they were designed with our needs in mind, and you’d have to be a real malicious jackass to mess em up before Thanksgiving, at the earliest. Squashes will last their longest when stored, undamaged, at around 55°F and 60% relative humidity. Warmer temperatures will make them lose weight and moisture. Colder temperatures risk damaging them, too. Garages, basements and root cellars are great options, but for us Brooklynites with limited space, perhaps consider leaving them near a front entryway to your home or near a cracked window– drafty air from outside will help keep them cooler and slightly moister than it is in the rest of your home. The fridge is a sorta OK place to keep em, but chances are they will get moist and rot faster. If you wanna get cray cray about it, you can wipe each one down before storing with a mild solution of vinegar and water (or bleach or hydrogen peroxide) to kill any mold or spores which may already be on the flesh. Be sure to dry them very very well! You’ll want to inspect them for nicks and damage, and eat any ones with signs of wear and tear first. Much like apples, they can be lightly wrapped in paper and placed in boxes, or you can just leave em out all cute and fall-time rustic style. It’s best to give them a piece of cardboard or fabric to sit on, as a hard surface can, after time, cause a mushy spot to develop. I’ve also heard you don’t want to store pumpkins with apples, because they can off gas to one another….kinda like me and my boyfriend after the chili tasting contest we went to last weekend. Butternuts generally last the longest, followed by big pumpkins and acorn squashes. Delicatas, like their name suggests, aren’t quite as hardy, but with diligence they can last well into the New Year! And did you know that, much like pumpkin seeds, you can roast the seeds of other squashes? Butternut, spaghetti, and acorn squashes all are fair game, brosef! So bust out your cumin and olive oil, salt n’ stuff and get those little crunchy pepitas a-roasting! Impress your friends! Charm your date. Give your kids a reason to like you! Did you know that there’s a National Watermelon Promotion Board? Yeah, me neither. Here’s what they say about storing their, presumably, favorite food. Compared to most fruits, watermelons need a more “tropical” climate – a thermometer reading of 55° F is ideal. However, whole melons will keep for 7 to 10 days at room temperature. Store them too long, and they’ll lose flavor and texture. After cutting, store watermelon in refrigerator for 3-4 days. Wash and quarter a whole melon, then cut each quarter into three or four wedges. Cut lengthwise along the seed line with a paring knife, and lift off piece. Using a fork, scrape seeds both from the removed piece and the remaining flesh on the rind. Use for cubes or continue with recipe. Ah! and what’s more there’s apparently a California Melon Research Board. California doesn’t have a steady supply of drinking water, but they have a melon research board. Anyways, this is what they suggest for storing cantaloupe. “How should cantaloupes be stored at home? Turns out eggplants don’t like the refrigerator anymore than cucumbers or tomatoes. In a perfect world (which this clearly isn’t) they’d be kept at 50 degrees and consumed quickly. So, the choice is yours: bundle them up in a paper towel and plastic bag and keep them on the top shelf of your fridge, or leave them on the table top at room temperature. Either way eat em up quickly, ideally within a day. And because I’ve always wanted to know myself, here is a recipe for Babaganoush. Turns out it’s easy. Prick eggplant with a fork and place on a cookie sheet lined with foil. Bake the eggplant until it is soft inside, about 20 minutes. Alternatively, grill the eggplant over a gas grill, rotating it around until the skin is completely charred, about 10 minutes. Let the eggplant cool. Cut the eggplant in half lengthwise, drain off the liquid, and scoop the pulp into a food processor. Process the eggplant until smooth and transfer to a medium bowl. On a cutting board, work garlic and 1/4 teaspoon salt together with the flat side of a knife, until it forms a paste. Add the garlic-salt mixture to the eggplant. Stir in the parsley, tahini, and lemon juice. Season with more salt, to taste. Garnish with additional parsley. I’m really grasping at straws with this title. Suffice it to say this is about storing corn. NOTE: This info was wholeheartedly ganked from this website. Corn, like most things, is best eaten shortly after harvest. “You can wrap unhusked ears in a plastic bag and refrigerate until preparation time. Do not remove husks before storing fresh corn….The husks help retain freshness. Corn freezes well on or off the cob, but for best results it must be blanched and frozen soon after harvesting. To blanch sweet corn on the cob, use a large stockpot partially filled with water, enough to cover several ears at a time. Bring the water to a rolling boil, then place the corn in the boiling water. Begin timing as soon as you immerse the corn in the boiling water. Cover the pot and boil on high temperature… small ears for 7 minutes, medium sized ears for 9 minutes, and large ears for 11 minutes. You may use the same boiling water two or three times. After boiling, cool the corn immediately in ice water for the same amount of time as it was boiled. Drain the corn thoroughly. ALLLSSSOOO: have you ever heard of milking corn cobs? My friend and fellow Core group member David taught me about it. Once you cut the corn off the cob, run your knife over the cob vigorously several times, pulling the starchy liquid out of it and any of the little bits of kernels that are still left. It creates a white milky substance that is great tossed into a pasta dish or into soups–it adds sweet starchy awesomeness. Give it a try!